A 1970s slogan about rock 'n' roll proclaimed, "If it's too loud, you're too old." That might be adapted for the movie "Cloverfield" to read, "If it's too pointless, you're too old." Too old to appreciate the earth-shaking explosions and terrific sound effects without believing a movie needs more than that to succeed. Too old to tolerate palsied jerking of a handheld camera in every frame. Too old to overlook shallowness of characterization, ludicrous implausibilities, lack of explanations and utter meaninglessness of story. That doesn't mean, on some primal level, that you can't enjoy the ceaseless devastation of New York and the atmosphere of intense, unflagging panic that director Matt Reeves sustains. The guys behind me at the preview, who looked to be in their 20s, were rocked by the mayhem. The twitchy camera, carried everywhere on the night of the assault by the hero's pal, seemed a clever modern technique to them, not a distraction. Those two guys he mentions were me and my former roommate, who I took with me as my guest to the screening. Just as he is one of the older male critics I have mentioned pooh-poohing the film after the screening. Nothing has weight or complexity in this universe. Nothing resonates in the memory. Nothing needs to be explained, because thinking is beside the point -- in fact, it's against the point. "Cloverfield" is a non-stop smashfest meant to be forgotten as soon as it's over, then repeated the following weekend for people eternally hungry for empty sensations. If you're too old for that, find yourself another film. Now that is a bit of an unfair criticism. After all, I named There Will Be Blood the best film of 2007, and with a quick look at my top ten list, it's pretty clear that I'm not someone who likes to turn their brain off in films. If Cloverfield had explained anymore than it had, its effect would be ruined. It makes us think by filling in the gaps with our imaginations...how many mainstream action flicks can claim to do that? What makes its scary is how it disorients us, plot is arbitrary here. While plots are usually a good thing to have, they are not necessary in every case - anyone who has seen Un Chien Andalou can attest to that. 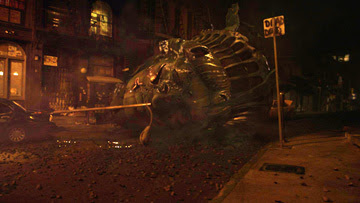 Cloverfield is a movie designed to scare, set up like a real-time captured video that has been found by the military. A conventional plot would have ruined the concept. Instead, Cloverfield sticks to its guns, stubbornly refusing to give us anything resembling conventional plot or character development...which is why it feels so chillingly real. All respect to Mr. Toppman, but I think he totally missed the point here, too quick to dismiss a movie whose premise he never bought to begin with. Thank goodness the nay-sayers are in the minority - the film is enjoying a 71% positive rating on Rottentomatoes. It's easy to brush off a commercial thriller like Cloverfield on concept alone, but it's hard to ignore one that is so cleverly conceived and ingeniously executed. And as for not being able to remember it, I couldn't disagree more. Cloverfield won't soon be forgotten. Yeah I think the old guy was snoring through the screener. On the Friday (day of the release) evening edition of the WCNC news cast, he stated the audience never really sees the monster. Kick the old coots chair next time would ya?